Goodreads: Jon Reiner was middle-aged, happily married with two children, living on Manhattan's Upper West Side, and acclimating to his role as primary parent-caregiver when he suffered a near-fatal collapse due to complications from his chronic battle with Crohn's disease. From that point, he was forbidden from eating food, fed intravenously, and denied the pleasures of taste, which, as an award-winning food writer, had been a central part of his life. 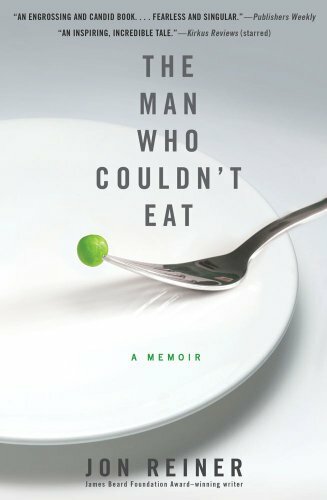 In The Man Who Couldn't Eat, Reiner reinvents the foodoir, recounting what happens when a man obsessed with food cannot eat, and what happened to his family as a result. Coping with illness, unemployment, and financial ruin spun him into a deep depression, straining his relationship with his wife and children. It was his deprivation, ironically, that forced Jon to recognize what he'd been taking for granted. Kritters Thoughts: What an interesting read. After reading the book, I am still asking myself questions. How often does my day center around food? How many times a week do I schedule visits with friends and family where food is the main decision? The reader meets Jon Reiner, a husband and father of two young boys who has been battling Crohn's disease for more than 20 years. With Crohn's disease being an illness that does not have a cure, but with changing a lifestyle you can live with the disease, I would still call it a terminal illness. As we meet him, he has been struck down by the disease and is fighting for his life. I appreciated where he started this book, so right from the start you are in the heart of his story and are enveloped into his world. The part of the story that struck me the most was seeing the impact that his disease and health have and had on both his wife and two boys. Sometimes I don't think we realize that our status can absolutely affect those around us both in positive and negative ways. A book that takes you behind the scenes of a family that as a whole must overcome this disease and learn to live a life without food as a center. Disclosure of Material Connection: I received one copy of this book free of charge from the author and Booksparks PR. I was not required to write a positive review in exchange for receipt of the book; rather, the opinions expressed in this review are my own. I have Celiac so I can relate, but to be a food critic and then lose your ability to eat? How tragic is that? Anyone who can remain positive in a situation like that has my respect.